LeoVegas is a rather new addition in the crowded online casino industry and they managed to achieve a success thanks to the fact that it brought a few innovations to light. One of the main things that manage to help LeoVegas casino stand out of the crowd is the fact that the games come from a multitude of software developers and at the same time there is always an extraordinary online welcome bonus package. The site was launched in 2012 and it is licensed under the jurisdiction of Malta and United Kingdom. The welcome bonus package from LeoVegas is given during the first four deposits that you make. 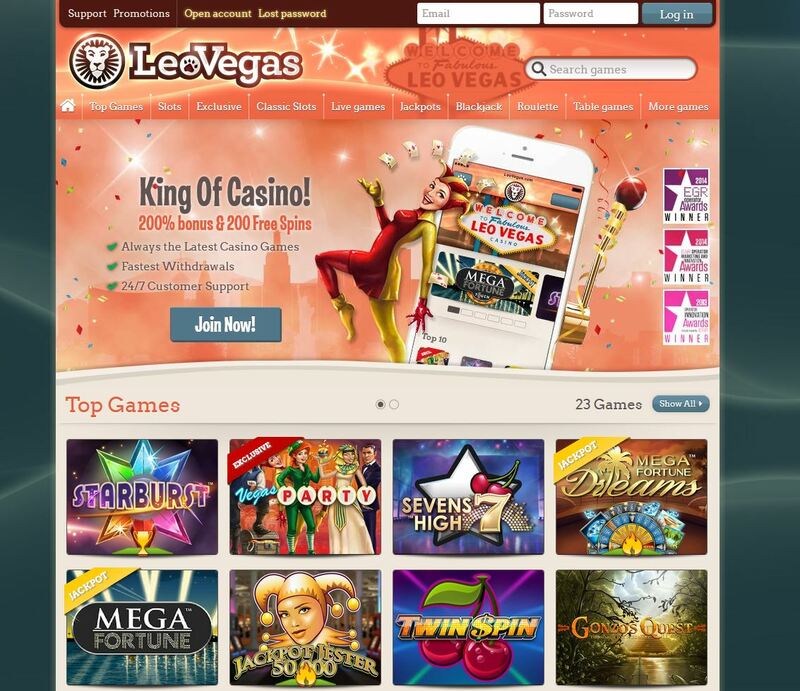 As you sign up for a new real money account for LeoVegas, you get the opportunity to receive a free no deposit bonus where you are allowed to get 20 free spins. It all starts when you make a deposit for the first time. That’s where you will get an excellent 200% welcome bonus that goes up to 50 euros. There is an additional set of 180 free spins available on a daily basis for the next 9 days as a player. The second deposit goes up to €400 at 100% match rate. The third deposit brings you an additional €400 at 100% rate, while the fourth deposit allows you to get a maximum amount of €150 at 50% rate. Another great achievement of LeoVegas online casino was the fact that thanks to their mobile slot machine one of the biggest progressive jackpot was won at this casino. This way a prize of 5.6 million euros was won by a lucky player. The games that you can find at this online casino are provided by a multitude of online software developers. This is the full list: Net Entertainment, Microgaming, IGT, Bally, Nextgen, Evolution Gaming, Cryptologic, Play’N GO, Yggdrasil Gaming and Quickspin. New games are added on a constant base and there is also a mobile version of the software. The games collection is excellent and there is always the possibility to find some of the most popular online slot machines in the world. Things are always kept simple while playing at LeoVegas and you can find a multitude of payment methods that can facilitate you to make deposits like: MasterCard, Visa, Skrill, Neteller and Paysafecard. The cash out times are always small and you should expect to have your withdrawals processed in less than 24 hours. However before your first withdrawal you will need to go through a verification process where you have to provide an ID copy and a proof of your address. The customer support service is available via e-mail, live chat and toll free phone number. As soon as you get in touch with the LeoVegas customer support representatives, you will get the chance to find some professional and efficient staff members that are able to assist you with any problem you might have.